The results are in; The county’s lawyers have spoken. One hundred and twelve lawyers — 50 percent of the county bar’s dues paying members — cast ballots in the Kitsap County Bar Association’s perennial preference poll, which included 11 lawyers who are vying for Gov. Chris Gregoire’s nod to join our local superior court bench. Ballots are cast anonymously. Greg Wall, Port Orchard-based general practice lawyer. Wall had previously run unsuccessfully for Kitsap County Superior Court judge in 2008. He was elected in November to the South Kitsap School Board. Kitsap County Superior Court Judge Russell Hartman is stepping down at the end of the this month and Judge Theodore Spearman died in January, creating the openings. Gregoire will make the appointments but all eight superior court seats are up for election in November (though incumbents in judicial elections generally have an advantage). So, if the governor picks ’em, why does this poll even matter? * Stephen Holman’s appointment (by the county commissioners) to the Kitsap County District Court bench in 2006. *James Docter’s election wins for Bremerton Municipal Court in 1997 and 2009. It also has its shortcomings: In 2008, a three-way race for retiring Kitsap County Superior Court Judge Leonard Costello’s seat saw Wall get the most votes among attorneys — yet he lost in the primary, and Kingston attorney Jeanette Dalton was eventually elected. The governor is expected to make her replacement picks in the coming weeks. The two candidates for Bremerton Municipal Court judge are facing new challenges less than a week before the votes are counted. 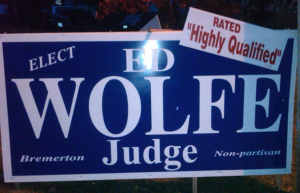 At some point during this month, signs for attorney Ed Wolfe, who is challenging incumbent judge James Docter, began appearing with small placards that say “RATED Highly Qualified” (see photo that was emailed to me by a Docter supporter). He said that the poll was still taken by only 63 lawyers, even though there are hundreds of attorneys in the county. Meanwhile, Port Orchard resident Stephen P. Miller has filed a complaint with the Public Disclosure Commission (PDC) against incumbent James Docter. His allegation: that Docter stated, during a Bremerton Kiwanis candidate forum Oct. 8, he, nor his clerks, had found evidence that Wolfe had handled a criminal trial in Bremerton Municipal Court. Miller believes that a “reasonable person” would conclude Docter was using city paid clerks to help with his campaign. I called Docter about the allegation, and he said he felt it was “completely baseless.” He said he’d asked a clerk at lunch one day if she could recall anytime Wolfe had in fact handled a criminal trial in order to double check his own memory. She explained she was in the court’s break room at lunch one day when Docter and a clerk discussed if Wolfe had handled any such trials. But she was adamant that such discussions did not happen while on the city’s paid time. The complaint won’t be followed up by the PDC until after election day. Looks like we’ll have at least one contested election in this fall’s Kitsap County Superior Court judge contests. 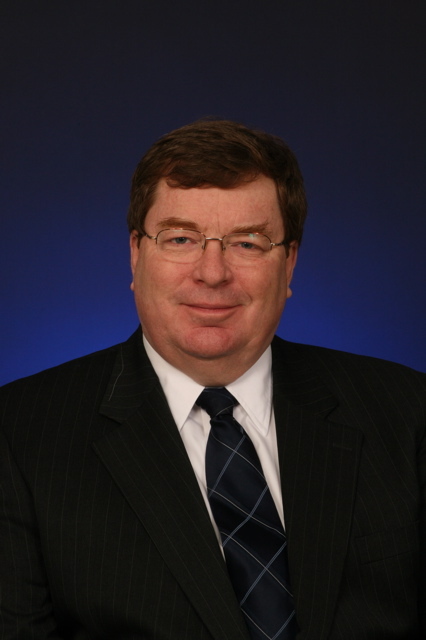 I received an email today that Bruce Danielson will be going for position #1 which Judge Leonard Costello will vacate. Danielson has told us already his aspirations to run, but hadn’t decided which seat he was going for (until now). It appears he’ll face Greg J. Wall, a longtime Port Orchard lawyer who has already said he’ll be running for the seat vacated by Costello. That leaves uncontested races for the seven other incumbents (for now): Anna M. Laurie, M. Karlynn Haberly, Leila Mills, Russell W. Hartman, Theodore Spearman, Jay B. Roof and Sally F. Olsen. But filing week isn’t until June, so we’ll see what happens.